This rotti is one of the most successful experiment till date. I used whatever was handy & the result was yummilicious rotti. It all started with my pantry running short of rice flour. I thought for a long time about what to name for this rotti & finally came up with "Poustic rotti" because this rotti as the name suggests is literally filled with nutrition. Wax paper/Brown paper/aluminium foil to pat the rotti. Remove the drumstick leaves from the stem (use only the leaves, discard all the stem), wash it thoroughly in water & finely chop them. Mix the mashed rice, drumstick leaves with all the above mentioned ingredients(except water) in a large bowl. Add water little at a time & make a smooth dough with it. (Dough consistency should be similar to that of a cutlet or patty dough). Make medium orange sized balls with the dough. Drumstick leaves could be replaced by other leafy vegetables like coriander leaves, dill leaves or fenugreek leaves. Verdict: I am forced to write this, all Karnataka style rotti lovers will love to eat this rotti again & again. Though I stayed in India for 5 weeks, I feel I could have stayed there for long (btw, this was my second visit this year..).., yeh dil maange more! My son's condition is no better than mine. Last weekend.., he was telling me.., appa mane aithalla, eega punah ajji manege hogona!! (Now that we visited daddy's house, I think we should go now to grandmom's home!!). This recipe is to revive the memories I spent with my loved ones. My mom-in-law makes excellent ladies finger sambar. I learnt this from her. Before I jump into the recipe, here is a quick note. For this recipe, you don't have to fry the ladies finger to remove the stickiness from it. Tamarind water + jaggery + salt will do it for you. (I have mentioned here about how to remove the stickiness of the ladies finger). So, even if you are an amateur in using ladies finger, you can go ahead preparing this one. Meantime, while the ladies finger is being cooked, prepare the ground paste. Add the oil to a small pan, when oil is hot, add cumin seeds, mustard seeds. When the seeds turn golden brown, add cinnamon, coriander seeds, curry leaves. Saute till the seeds leave out a nice aroma & curry leaves become crisp. 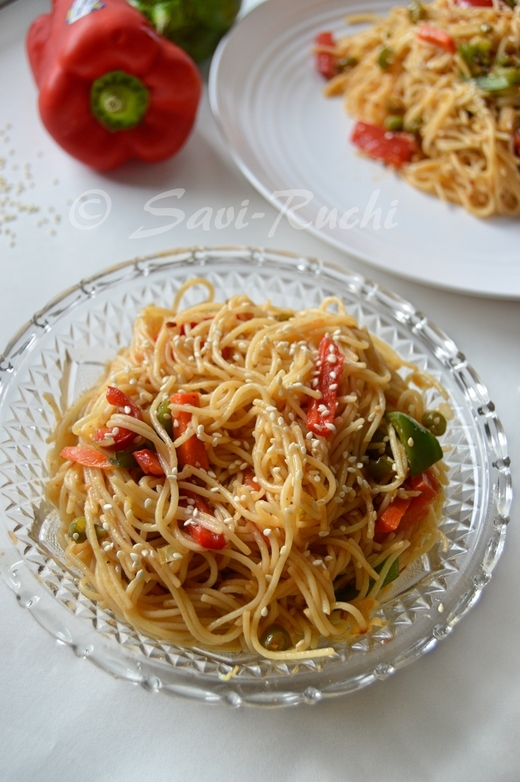 Add the red chillies & saute till the red chillies change color(takes around 30secs to 1 minute). Turn off the heat & add asafoetida. Allow the roasted spices to cool. Once the spices come to room temperature, make a fine paste of the spices + grated coconut, by adding enough water. Pressure cook the pigeon peas/toor dal with a small pinch of turmeric for 3-4 whistles. Allow it to cool & mash it gently. Extract the juice from the tamarind. Squeeze the juice & dilute it by adding 2 cups of water. Pour the tamarind juice to a big vessel. Add salt, jaggery to the tamarind juice. Add the chopped ladies finger to the tamarind water. Boil the vegetable till soft & yet firm. When the ladies finger is cooked, add the cooked dal, spice paste & mix well. Pour in a 1/2 cup (a little less is fine too) of water & allow the mixture to boil on a medium-high heat. Finally prepare the tempering* using the ingredients mentioned under tempering section & pour the tempering on the sambar prepared. Garnish it with corinander leaves. Mix well & serve hot with rice & a side dish of your choice. *Here is the method for preparing the tempering. Heat oil in a small pan. When oil is hot, add mustard seeds. When mustard seeds splutter, add curry leaves & saute till curry leaves are crisp. Turn off the heat. Tempering is ready. Curry leaves tambuli is good for digestion, has cooling effect on the body & rich in iron. Just like other tambuli, this is very easy to prepare. This dish goes well with rice. Refer here to know more about curry leaves. 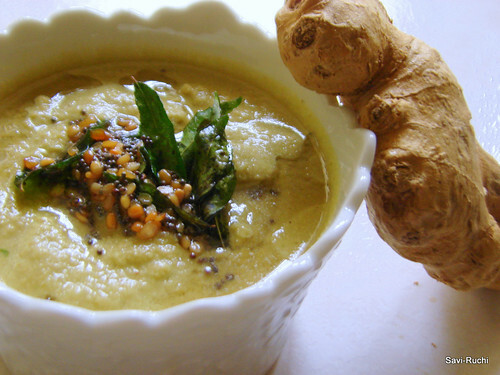 Make a smooth paste of coconut, curry leaves, green chillies, cumin seeds. Scoop out the paste. Add buttermilk, salt to the paste prepared & mix well. Prepare the tempering. Heat oil in a small pan. When oil is hot, add mustard seeds. When seeds splutter, add curry leaves, asafoetida & finally pour the tempering on the tambuli prepared. Serve it cold or at room temperature with rice & fritters/papad/pickle. Sorry people for vanishing without notice. I was enjoying my vacations in India. After I'm back from my trip, I am in no mood to cook. Hence, for the next couple of weeks until I settle down, I am planning to post the recipes that are waiting in my drafts. Shunti/Ginger chutney is a versatile side dish/dip that goes well with any South Indian breakfast items like dosa, idli, rotti, chapathi, upma or uttappam. Here is the recipe for those who wish to try! Remove the skin of the ginger & chop it. Mix all the ingredients(except tempering ingredients), add little water & grind them to a smooth paste. Adjust the consistency of the chutney by adding water. Scoop out the paste in a bowl. Now prepare the tempering by adding oil to a small pan When oil is hot, add mustard seeds & urad dal. 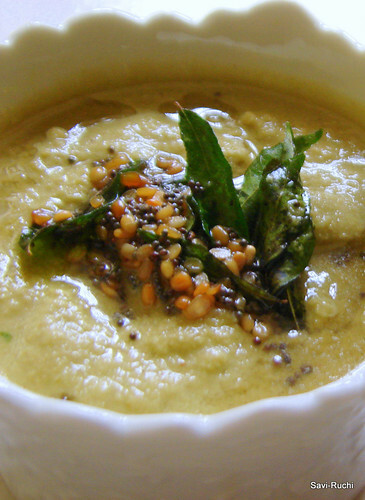 When dal turns golden, add curry leaves & turn off the heat. Pour the tempering over the chutney, mix well & serve. PS: During my vacation, I have received many comments. I remember that there were some recipe requests & awards too. I'll collect the awards and look at your requests soon. Thanks for your patience !! !